MH EXPRESS: The transport minister believes reintroducing the rail service is vital to future national development. WITH several international entities said to be expressing strong interest in the Jamaica Railway Corporation (JRC), transport and mining minister, Mike Henry, stands firm behind his decision to use taxpayer dollars to commence the resuscitation of the railway system and expresses his intention to get the rail service fully back on track. “Leaders in any industrialized country will tell you that rail service is absolutely essential to development and is the most economic form of transportation. 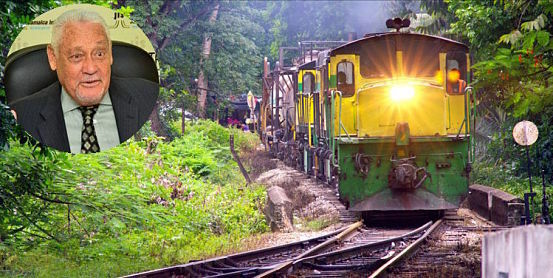 The rail service in Jamaica was once classified among the 11 wonders of the world. Has it helped us? Indeed, it has. The network it provides made the development of the bauxite-alumina industry in the 1950s-1970s viable,” the minister noted in a Sunday Gleaner column, responding to recent criticism of his determination to get the rail service going again. In many parts islandwide, the minister points out, abandoned rail lines and attendant bridges have been vandalized to sell to the scrap metal trade. “Had I not taken the decision, we would have nothing left to entice those who now have an interest in rail, whether for cargo, passenger or specialty tours,” he says.